What a terrific prop replica from Star Wars: Episode IV - A New Hope! To ensure that this beautifully crafted 1:1 scale plastic Star Wars A New Hope Stormtrooper Helmet retained all of the subtle nuances of the hand-sculpted original, the engineers at eFx Collectibles digitally scanned a surviving original helmet. It's an amazing and iconic piece of Star Wars history that you can wear! Comes with certificate of authenticity. Fearless and unswervingly loyal to the Emperor, Stormtroopers are the most recognized symbol of Imperial might. Encased in white armor over a black bodyglove suit, Stormtroopers make up the bulk of Emperor Palpatine's ground-based armies and the space-based imperial Starfleet. 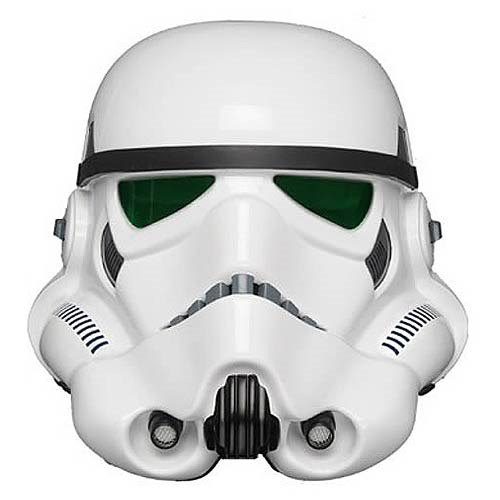 Their fearsome-looking helmets allow the soldier to breathe in the harshest of environments, including the vacuum of space, and are equipped with long-range communications, allowing these elite shock troops to be deployed with speed and efficiency to quell insurrections and maintain order across the many planets of the Galactic Empire. The distinctive design of the Stormtrooper was originally created by famed concept artist Ralph McQuarrie in 1975. McQuarrie designed several versions of the look of the empire's general infantry.